West Side Story (1961) is an energetic, widely-acclaimed, melodramatic musical - a modern-day, loose re-telling of Shakespeare's Romeo and Juliet tragedy of feuding families, although the setting is the Upper West Side of New York City in the late 1950s with conflict between rival street gangs rather than families. West Side Story is still one of the best film adaptations of a musical ever created, and the finest musical film of the 60s. It arrived at a time when the silver screen was realizing tremendous competition from TV and other genres of cinematic entertainment. Like many other musicals of its time, Hollywood again looked to a successful Broadway stage play (first starring Carol Lawrence and Larry Kert) for its source material (e.g., in earlier years, South Pacific (1958), Oklahoma! (1955), and Carousel (1956) were chosen, among others) and it was no different for this film. An almost completely new cast was assembled, except for actor George Chakiris (who played Riff, NOT Bernardo, in the London production). After her success in Spendor in the Grass (1961), Natalie Wood was chosen for the lead female role after Barbara Luna was considered. And Richard Beymer, known for his performance as Peter Van Daan in George Stevens' The Diary of Anne Frank (1959), took the lead male role which was also considered for Marlon Brando and Elvis Presley. Chita Rivera, the Broadway actress who played the part of the tempestuous Anita, was replaced by Rita Moreno, known for her role as Tuptim in The King and I (1956). Supporting actor Russ Tamblyn, known for many roles in films such as Seven Brides for Seven Brothers (1954) and Peyton Place (1957), played the role of Riff. 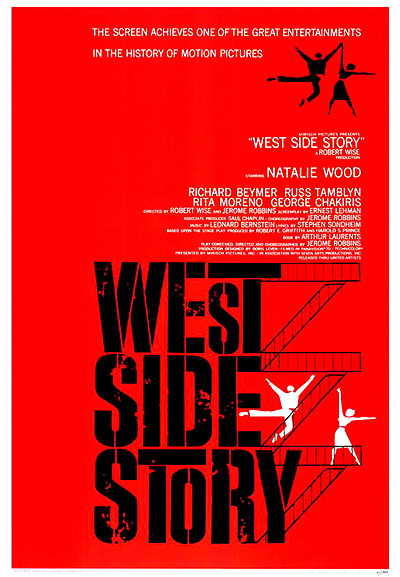 The ground-breaking, dynamic film of 1961 was based on the successful Broadway hit - a staged musical play (opening in 1957) by writer Arthur Laurents and directed/choreographed by Jerome Robbins. The play reworked the traditional love story material (of lovers that crossed racial/ethnic barriers) and translated it, in a radical, novel and revolutionary style for a musical, to include racial strife between rival New York street gangs (newly-arrived Puerto Ricans and second-generation Americans from white European immigrant families), juvenile delinquency and inner-city problems of the mid-twentieth century - in exhilarating musical and dance form. To capture the realism of the social tragedy and its urban environment, some of the film was shot on location in Manhattan (in abandoned West Side tenements around 110th St., and other settings), but most of it was actually filmed on sound stages with stylized, artificial studio sets. The stage book was rewritten and adapted for the screen by Ernest Lehman, and the film retained the beautiful and electrifying musical score, songs and lyrics of Leonard Bernstein and Stephen Sondheim. It was co-directed by two clashing individuals from the start - veteran director Robert Wise and exciting choreographer Jerome Robbins. Both shared credit for the film's direction although Robbins was removed after a few months due to schedule delays, the over-budget production, disagreements with Wise over the film's degree of faithfulness to the stage production, and Robbins' potentially-expensive demands for perfection. The four kinetic dance sequences that Robbins choreographed ("Prologue," "America," "Cool," and "Something's Comin'") and the jazzy, interpretative score of Bernstein rhythmically communicate the passionate intensity, frustration and tough violence of the streets. The much-praised, box-office blockbuster for United Artists received eleven Academy Award nominations and won all but one - Best Adapted Screenplay. Its achievement as a ten Oscar winner has only been surpassed by three films (all with eleven Oscars): Ben-Hur (1959), Titanic (1997), and The Lord of the Rings: Return of the King (2003). West Side Story's Oscar awards include: Best Picture, Best Director (Wise and Robbins - the first time that awards went to co-directors), Best Supporting Actor and Actress (George Chakiris in his first major film role and Rita Moreno), Best Color Cinematography, Best Color Art Direction/Set Decoration, Best Sound, Best Scoring of a Musical Picture, Best Film Editing, and Best Color Costume Design. Robbins was also awarded a special statuette for "his brilliant achievements in the art of choreography on film." Robbins was the only Best Director Oscar winner to win for the only film he ever directed. Robert Wise won his second directorial Oscar for The Sound of Music (1965). Natalie Wood was un-nominated for West Side Story, but she was competing for a Best Actress Oscar (that she lost to Sophia Loren for Two Women) for her role in Spendor in the Grass (1961). During the opening prologue, a breathtaking aerial shot of Manhattan from a bird's eye view captures the city with its bridge traffic and highway ramps, its waterfront docks, parks and skyscrapers. The camera passes over recognizable landmarks as it moves steadily to the Upper West Side of Manhattan, and then speedily zooms down and plunges into a concrete playground. A gang of 'cool' white youths are posed together in one corner of a basketball court, clicking their fingers to the syncopated rhythm of the musical score. The aggressive gang members leave the fenced-in playground and cross the tenement street. In the famous, dazzling opening sequence, they gradually break into a highly-stylized dance and then burst into a daring, high-stepping sequence - an exhilarating, inventive, visual ballet of pirouettes, vigorous athletic moves, and running jumps that symbolizes their dominance and energy - they are readying themselves for a gang brawl. They are members of the Jets composed of white teens, led by brown-haired, All-American type Riff (Russ Tamblyn). [They represent one side of the racial rivalry, similar to Shakespeare's tense and feuding families, the Montagues and the Capulets.] Two of the gang members face off against one member of a rival gang, Sharks leader Bernardo (George Chakiris), a darker-skinned, black-haired Puerto Rican immigrant. He is joined by his gang members, and they pick up the beat by clicking their fingers. The gangs both are vying for control of the streets, alternating between dominance and submission. Two of the members provoke each other, and after an extended confrontation, a full-scale brawl breaks out when the Jets come to rescue Baby John (Eliot Feld), the youngest member of their gang, from an assault by the Sharks. Bernardo: (to his gang) OK Sharks, vaminos. Schrank: Boy, as if this neighborhood wasn't crummy enough. (to the Jets) Now look, fellas. Fellas? Look, let's be reasonable, huh? If I don't get a little law and order around here, I get busted down to a traffic corner. And your friend don't like traffic corners. So that means you're gonna start makin' nice with the PRs [Puerto Ricans] from now on. I said nice - GET IT! 'Cause if you don't, and I catch any of ya doing any more brawlin' in my territory, I'm gonna personally beat the living crud out of each and every one of yas and see that you go to the can and rot there. Say goodbye to the nice boys, Krupke. Riff: Now we fought hard for this turf and we ain't just gonna give it up...The Emeralds claimed it. We shut 'em out. The Hawks, remember, they tried to take it away, and we knocked 'em down to the cellar. Riff: Hey, you heard what that Lieutenant Schrank said, eh? We gotta make nice with 'em Puerto Ricans or else. We gotta let 'em move in right under our noses and take it all away from us, or else. Riff: You're damned right NO. So what are we gonna do buddy-boys? I'll tell ya what we're gonna do. We're gonna speed fast. We're gonna move like lightnin'. And we're gonna clean them Sharks up once and for all so they ain't never gonna set foot on our turf again. And we're gonna do it in one, all-out fight...The Sharks want a piece of this world too. And they're real down boys. They might ask for blades, zip guns...I say this turf is small, but it's all we got, huh? Now I want to hold it like we always held it, with skin. But if they say blades, I say blades. If they say guns, I say guns. I say I want that just to be the number one - to sail, to hold the sky...OK cats, we rumble. Now, protocality calls for a war council between us and the Sharks, to set the whole thing up. So I would personally give the bad news to Bernardo. Riff proposes getting help from Tony, a young Polish boy and ex-leader of the Jets who has grown away from them and taken a respectable job: "We need Tony. He's got a rep that's bigger than the whole West Side...He always came through for us and he always will." Tony could serve as the Jets' lieutenant for the impending showdown. Riff: Now I know Tony like I know me and I guarantee you can count him in. Action: (Tony Mordente) In, out, let's get crackin'. Gee-Tar: (Tommy Abbott) Where you gonna find Bernardo? Baby John: It ain't safe to go and be in our territory. Riff: He'll be at the dance tonight at the gym. A-rab: (David Winters) Yeah, but the gym's neutral territory. Riff: A-rab. I'm gonna make nice with him! I'm only gonna challenge him. Ice: (Tucker Smith) Great, Daddy-o! Riff: So listen, everybody dress up sweet and sharp. Meet Tony and me at the dance at ten. And walk tall! You're a gold medal kid with the heavyweight crown! Little boy, you're a man, little man, you're a king. Tony: Every single night for the last month, I wake up. And I'm reachin' out. Tony: It's right outside the door. Just around the corner. But it's comin'. Tony: I don't know. It's like the kick I used to get from bein' a Jet, you know? Riff: Oh, well now you're talkin'. Oh man, without a gang, you're an orphan. With a gang, you walk in twos, threes, fours. And when your crew is the best, when you're a Jet, you're out in the sun, buddy-boy. You're home free home. Tony: Riff, I've had it. Tony: I promised Doc I'd clean up the store tonight. Riff: Then do it after the dance. Tony, I already told the guys you'd be there. If you don't show up, I'll be marked lousy. Tony: What time'd ya tell 'em? Riff: Ten. For me Tony, for Riff! Riff: Who knows? Maybe what you're waitin' for will be twitchin' at the dance tonight? Could be, who knows? There's something due any day. I will know right away, soon as it shows. It may come cannonballin' down through the sky, gleam in its eye, bright as a rose! Who knows? It's only just out of reach, down the block, on a beach, under a tree. I got a feeling there's a miracle due, gonna come true, coming to me. Could it be? Yes it could, something's coming, something good. Maria: When I look at Chino, nothing happens. Anita: Well, what do you expect to happen? Maria: I don't know. Something. What happens when you look at Bernard? Anita: It's when I don't look that it happens. When Maria tries on the plain white dress with a wide red belt, she complains: "White is for babies," but after trying it on, she becomes ecstatic: "It is a beautiful dress!" Bernardo (regarded as a "watchdog" by Maria) views his sister as "a precious jewel." Maria: My brother is a silly watchdog. Bernardo: Ah, my sister is a precious jewel. Maria is thrilled and excited about her 'coming out' that evening: "It is most important that I have a wonderful time at the dancing tonight...because tonight is the real beginning of my life as a young lady of America." She spins backwards, and a rainbow of colors envelopes her - the background behind her turns black, and becomes the spinning shapes at the gym dance.